Katy Guthrie grew up as one of five girls. All five sisters took very different paths —one ended up in hospital management, another in marketing and advertising, one became an engineer and the other works in logistics for a start up. But Guthrie took a different route. Her love of science started long before she enrolled in classes at Northwest Missouri State University, but there she discovered her true love of plants. Guthrie took a required botany class, and less than a week into the course she was hooked. 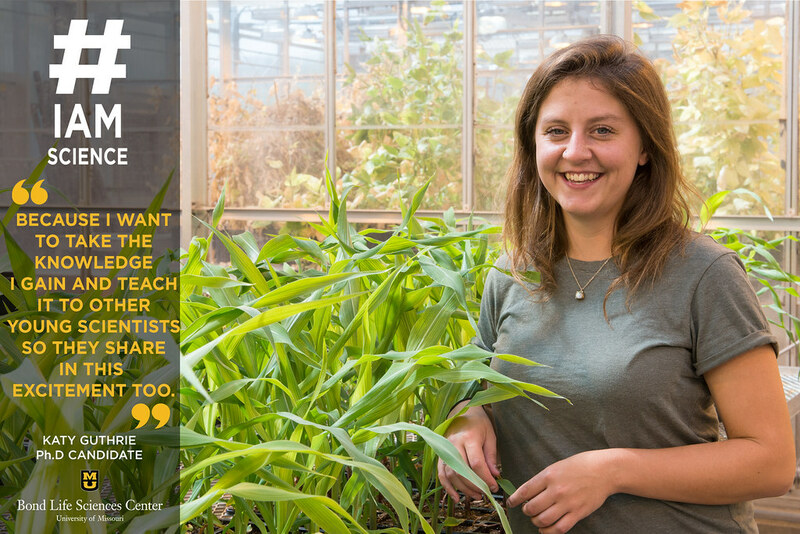 As part of Dr. Paula McSteen’s lab, Guthrie studies the reproductive organs of maize and how its genes allow it to produce flower-bearing structures in pairs, while other plants only produce these structures singly. It’s not an easy process, though, so Guthrie nurtures a unique approach to finding the solutions. Although her work can be painstaking, Guthrie noted that science is all about learning from mistakes. Ultimately, Guthrie wants to duplicate the gene that causes the doubling trait in other crops, such as rice, wheat and barley. This could have a big impact on cereal crop reproduction. “We’re hoping to apply what we learn about maize other crops,” Guthrie said. After finishing her studies at Mizzou, Guthrie plans to return to the classroom as a professor, preferably teaching undergraduates.